After four decades, Godin still seems like a ‘new’ brand. Why is that and who exactly is Robert Godin? A casual question recently posed, “so is Godin about the size of PRS Guitars?” made this writer again wonder why it is that after all these years of guitar making - 46, to be precise - Godin seems to be the perennial new kid on the block in the perception of so many players. Now I make as many electrics as I do acoustics. But who really makes electrics nowadays in quantity [in the USA]? Within the musical instrument industry, of course, Godin has long been recognised as a very major player. Robert Godin’s empire spans a number of brands, Godin, obviously, along with five acoustic guitar lines: Seagull, Norman, La Patrie, Simon & Patrick, and Art & Lutherie, not to mention the unique TRIC guitar cases. In addition, the company exports to over 65 countries and has always placed innovation as key to both its instruments and the way they are made. Godin doesn’t discuss numbers today: “It’s too hard at the moment,” he tells us. “Everyone is watching us, everyone wants to know how many instruments we make.” But to give you some idea, back in October 2011 on the eve of Godin’s 40th anniversary, Music Trades magazine stated, “Godin’s 600 employees produce in excess of 175,000 guitars a year.” Three years later, we were told the combined Godin brands were making around 4,000 acoustics per week and around 1,000 electrics (which included the Multiacs, 5th Avenue archtops, and Montreal semis). 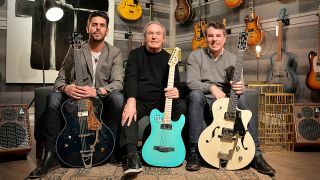 Almost five decades in, Godin remains a family owned business. “You know, it seems America doesn’t do family business. It’s a different mentality; it’s all corporations, investors, venture capitalists. You often don’t know who the runs the company, the director, and they’ve rarely invested a dime. It’s all like that. The innovation that lies at the heart of the company seems to infuse every level of the instruments we see. 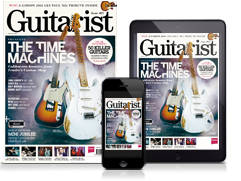 Similarly, Godin has implemented man-made materials such as Richlite, not as an alternative to rosewood or ebony, but “because it’s the best thing you can buy”, exclaims Robert. Godin, unlike many it seems, is more than happy to adapt to those changes.